Post-traumatic Stress Disorder, more commonly referred to as PTSD, can occur in any individual who has experienced or witnessed some type of life-threatening (or seemingly life-threatening) trauma in their life. About half of all women, and 60 percent of all men, experience at least one traumatic event during their lifetime. The type of trauma can vary drastically, including instances of abuse, assault, and combat, amongst other forms of trauma. When an individual serves in the military, there is a likelihood that they will be either witness or take part in, combat. Combat can often result in horrible scenarios, some of which are life-threatening, and can even be the cause of death. 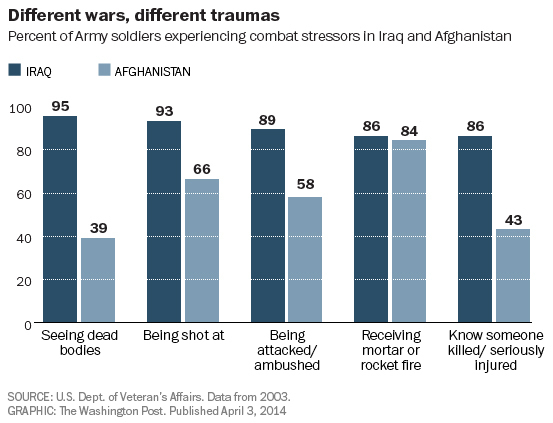 Currently, 20 percent of Iraq war veterans and 11 percent of Afghanistan war veterans report battling PTSD. Those numbers alone are alarming. What is more disheartening is that at the time that the Vietnam war was taking place approximately 11 percent of those veterans reported symptoms of PTSD, today 30 percent of those same veterans report struggles with PTSD. Why Is PTSD on the Rise with Past Veterans? So is Posttraumatic Stress Disorder actually on the rise amongst veterans, both past and present, or are we living in a time in which these veterans feel that they can confess these struggles to others? Part of the confusion here is that when the Vietnam war was being fought, the symptoms of PTSD were categorized under different labels, such as "shell shock" and "combat fatigue". Another factor is that morale was higher amongst those troops than it is amongst modern day troops. Perhaps the current events of the world is an additional stressing factor weighing on the minds of our veterans. Not enough studies are being done to confirm why there is such a large increase in past veterans coming forward and reporting PTSD. The bigger issue at hand is managing the influx in the number of soldiers from Iraq and Afghanistan wars who are reporting symptoms of PTSD. In 2011 more than 200,000 veterans of those two wars were being treated for PTSD by the United States Department of Veterans Affairs. This number is so large that a third of these service members are waiting longer than two weeks to receive medical care, which is the time frame that the VA strives to assist these patients during. As many family members and friends of past and current military members have witnessed, PTSD is a disorder that is often untreated, mistreated, and self-treated. Often times these service members find themselves being prescribed a number of different drugs to help with their mental state, sometimes this is a cocktail of drugs and other times it is a constantly changing regiment of medications. There are also a number of service members who are either still waiting to receive the help they so desperately need, or who have still not reached out for help. Just as PTSD has become an epidemic, so has self-medication amongst those who face the daily struggles of PTSD. At least 10 percent of military members who have returned home from deployments in Iraq and Afghanistan receive medical care for Posttraumatic Stress Disorder. Of that 10 percent, more than 20 percent of returning veterans who suffer from PTSD also face struggles of Substance Use Disorder. The most common drug of choice for soldiers and other service members is alcohol. What is even more interesting is that a third of service members struggling with substance abuse are also dealing with PTSD, proving that there is a definite link between the two. Symptoms of PTSD alone include trouble sleeping, anger, irritability, depression, hostility, and a feeling of being numb. Many of the veterans who turn to alcohol and other drugs are looking to subdue the memories, flashbacks, and nightmares. While this may be a temporary fix, it quickly affects an individual's sleeping patterns and also makes it much more difficult to be successful in the treatment of PTSD. This causes the symptoms to last even longer. The majority of our military that was sent to Iraq and Afghanistan were pulled from the Army, making this epidemic even more prevalent amongst soldiers. Up until the Iraq invasion in 2004 the rate of suicide in the military had stayed around 11 percent. After the invasion, we saw those numbers start to increase, and then double. Tragically the suicide rate amongst soldiers has risen to 20-25 percent higher than the suicide rate amongst civilians. This averages out to 21 veterans committing suicide every single day! This has become the "new normal" over the past seven years. Unfortunately, scientists still are not sure why there has been such a large increase in PTSD over the recent years. Even more disheartening is that the increase is so drastic that the VA cannot keep up, and too many service members are not receiving the help they so desperately need. The general public has ceased to show concern over this topic, making it seem as though everyone has accepted that this is just the way things are now. If you know a veteran who is struggling with PTSD reach out to help that person. You can offer to go to counseling sessions or to assist them in keeping records of side effects experienced on certain medications to help their doctors in better medicating their symptoms. You can always offer a listening ear and a shoulder to lean on during times of weakness. With rates of PTSD, Substance Use Disorder, and suicide on the rise amongst veterans, it is important to know where to turn to if you or a loved one need help.